You’ll find our blog to be a wealth of information, covering everything from local market statistics and home values to community happenings and more! That’s because we care about the community and want to help you find your place in it. Please reach out if you have any questions at all. We’d love to talk with you! Despite the increase in supply between $200k-$250k, there hasn't been a correlating increase in weekly list price reductions from sellers yet. However that is not the case for the market between $250k-$300k where weekly list price reductions have risen 46% in the past 8 weeks and weekly reductions between $300k-$400k have risen 61% since January. This isn't an indicator that sellers are becoming desperate. Make no mistake, there are very few desperate sellers in this marketplace. There are, however, many optimistic sellers who may be taming their expectations. Average annual price appreciation per square foot remains between 3.5%-5.0% for sales between $200k-$400k, so it's still a seller's market despite recent developments. Expect prices to continue increasing at least through the remainder of 2018. If your budget lies somewhere between $200,000 and $400,000 for a home, there's good news for you. Supply between $200,000 and $250,000 has been rising gradually over the past 12 weeks. After dropping 15% from 2,300 listings in January to 1,944 in May, it has since risen 8.1% to 2,101 listings in August, placing it only 6.7% below last year's count instead of 18% below like it was 3-4 months ago. Listings between $250,000 and $400,000 have also risen sharply 5.3% from 4,791 to 5,044 over the past 4 weeks, placing them only 0.2% below last year's count of 5,053 listings. The increase in competition has resulted in a notable 7.3% increase in weekly seller price reductions from an average of 778 per week in June to 835 in July. 56% of year-to-date sales in Greater Phoenix have been between $200k-$400k so this increase in supply should come as a little bit of relief for the majority of buyers. If you have a home listed between $200,000 and $400,000, then you make up 48% of everything that's listed in the MLS. Listings under contract in this price range have averaged 7.4% higher in volume than 2017 all year, until now. Over the last two weeks, including the end of July through the first week in August, listings in escrow have dropped to 2.2% below last year's level. Buyer activity is expected to slow seasonally from the peak in April through the end of the year; however open contracts have dropped 26% since the 2018 April peak compared to a lower 20% drop in 2017 over the same time frame; all while corresponding supply has been rising. Sellers haven't seemed to notice this sharper decline as their average asking price per square foot has soared from just 3% higher than last year in March to as high as 7% higher in July. The average sales price per square foot was up 5.9% in July, compared to 4.6% in June. However, price is a lagging responder to shifts in supply and demand. We will have to wait and see if buyers accommodate sellers' price expectations given that they have more to choose from in the marketplace right now. Let's look at the historical cost of a 1,900sqft home in Greater Phoenix, for example. In March 2005, a home that size would run $281k on average. Today that same home would be $309k, $28,000 more (+10%). However, the interest rate back then was 5.9% compared to 4.5% today, meaning that the principal and interest payment has dropped nearly $100 from where it was 13 years ago for the same home. At the same time, the median family income rose from $58k to $69k according to HUD (+19%). Which is why despite recent increases in interest rates, the affordability of real estate in the Valley is still considered good. Last April Corelogic released a report ranking the Greater Phoenix area as "overvalued". In fact, they placed 37% of our nations top 100 metropolitan areas in that category. As of May, after 6 years of higher-than-normal appreciation rates, the monthly average sales price per square foot has finally reached its place along the long-term 3% appreciation line established between 2000-2003 before the 3005 bubble and 2008 crash. Meaning that if we had fallen asleep in 2003, and the last 15 years were just a long horrible dream, we would have woken up today and not known anything had happened. Prices are where they would have been had the market followed the average long-term rate of inflation. That brings to light that current appreciation rates of 6% or more are no longer sustainable in the long term. However, that doesn't mean that prices will "peak" or "crash" anytime soon. most likely as demand slowly wanes, prices will go flat and hang out until they once again fall in line with the rate of inflation, but don't expect that to happen in 2018. Supply and demand measures today indicate another 3-6 months of positive appreciation for the majority of homes priced below $400k. Today we presented the check to The Joy Bus! The mission of The Joy Bus is to relieve the daily struggles of homebound cancer patients with a fresh Chef Inspired meal and a friendly face. Their vision is to elevate the livelihood of their patrons with the joy of culinary sustenance. 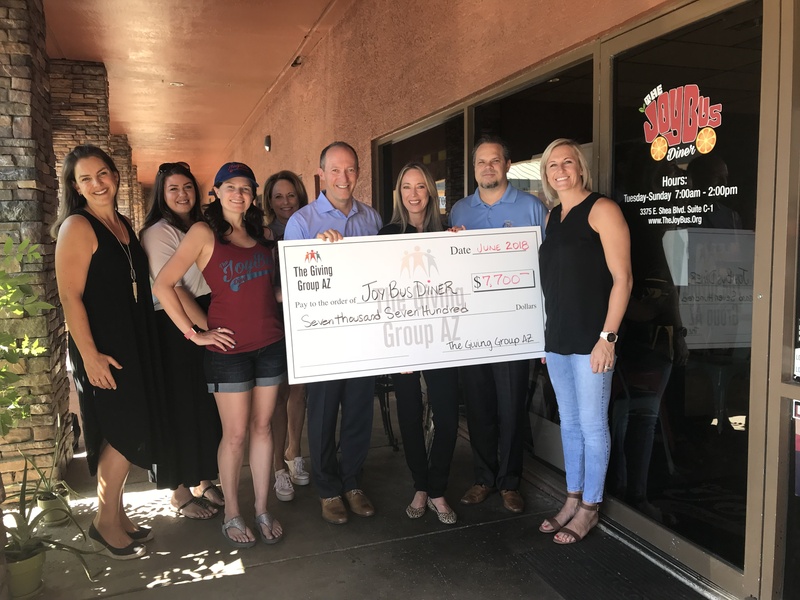 The Joy Bus Diner was opened here in Phoenix and is a 100% non-profit restaurant that is run by all volunteers. They provide hearty breakfast and lunch fare. Learn more about their story and how to get involved here. Economists have forecast that 800,000 people will leave California and New York for more affordable states like Arizona. Real estate values in Arizona are at an all time HIGH, but the inventory of available homes is at an all-time LOW. We are looking for homeowners that are ready to sell! 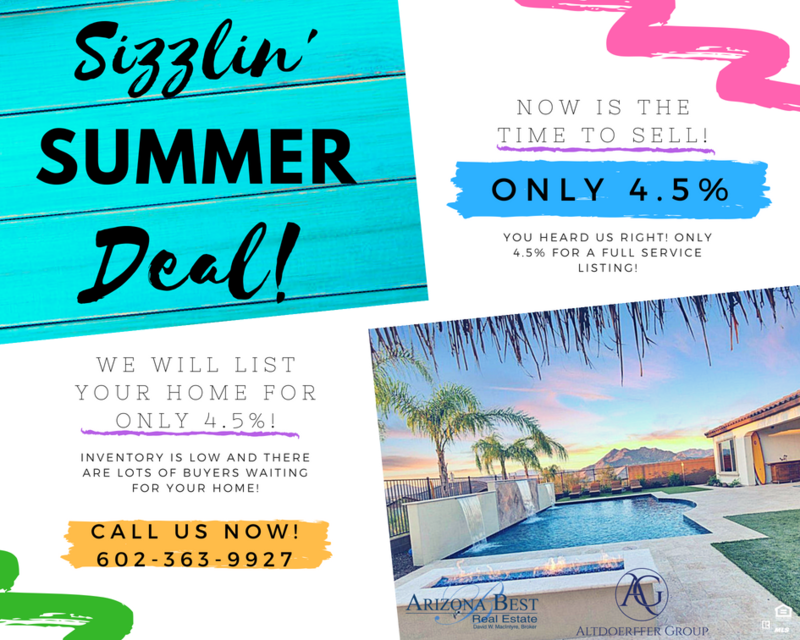 Take advantage of our SIZZLIN' SUMMER DEAL...a full service 4.5% listing...now through August. Despite the heat, we are putting several homes under contract per week!! Call 602-363-9927 to set up a personal in-home consultation today! Supply under $200K has continued to drop rapidly, but the $175K-$200K range has accelerated its decline over the past month far more dramatically than any other price range. After being consistently 30-35% below last year, the active supply level dropped a whopping 18% in a 3-week period putting the current count for this group 44% below last year. Single family homes only make up 41% of active listings under $200K, but they account for 69% of actives between $175K-$200K. As more buyers are looking to condos and townhouses for affordable housing, supply for attached homes under $200K has dropped 33% over the last year. However, condo supply between $200K-$300K has actually risen 10% while single-family homes in the same price point have dropped 15%. 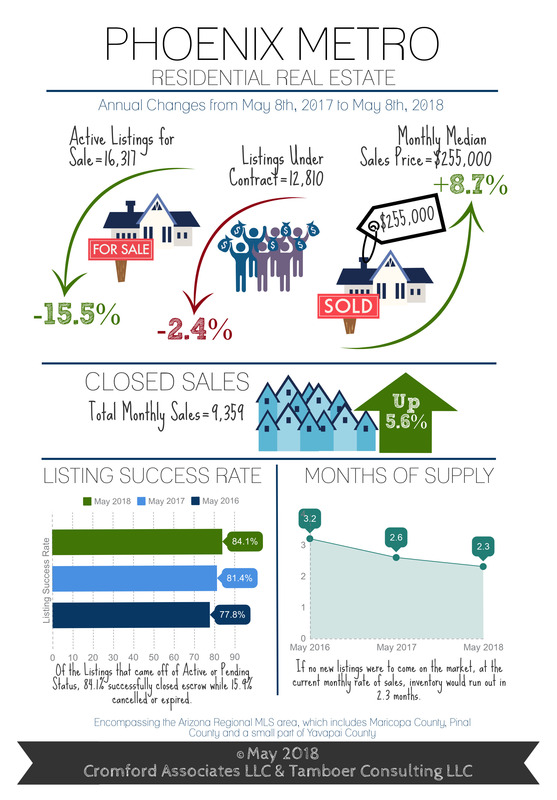 We are officially at the peak of the market seasonally for listings in escrow. Over the next few weeks, especially as temperatures reach over 100 degrees in the Valley, expect to see a gradual decline in buyer contracts that will continue through the end of the year. This is a seasonal trend that consistently happens every year and in every price point, even the frenzy market under $200K. The one exception is the luxury market over $500K. While it’s typical to see a decline at the beginning of Summer like everyone else, escrow counts tend to drop for a couple months and then go flat until the end of the year.  In fact, luxury supply drops more than buyer activity does in the Summer making it a great time to list luxury property for those willing to brave the heat between June and September. Welcome to the gated community of Lone Mountain, just west of Scottsdale Road. This 3 bedroom, 2.5 bath home features a den that can easily be converted to a spacious fourth bedroom. An open concept with lots of windows highlight the desert views and north/south exposure of this premium lot. Swim year round in the heated pool...relax under the covered patio by the fireplace or at the ramada with built in BBQ. Superior landscaping and lighting has all been done for you. Inside you will enjoy the spacious living area, chef's kitchen and formal dining room. The private master suite boasts a walk-in closet that you won't believe! The lot size, location and interior/exterior upgrades of this home make it an incredible value.